I'm the kind of person who will set themselves impossible challenges and then beat themselves up for not accomplishing them. Read sixteen Dickins books in six month. Read War and Peace in two weeks. Read fast, read now. I did manage to read thirteen Dickins books in the six months and I did read War and Peace in two weeks, which I am very proud of. The size of that book. It was good too. I'm constantly setting myself challenges. I have certain habits to that make no sense to 'normal' readers. I only read one book at a time, I only read church related books on a Sunday, I like to marathon series, and I have to finish a book once I've started it. 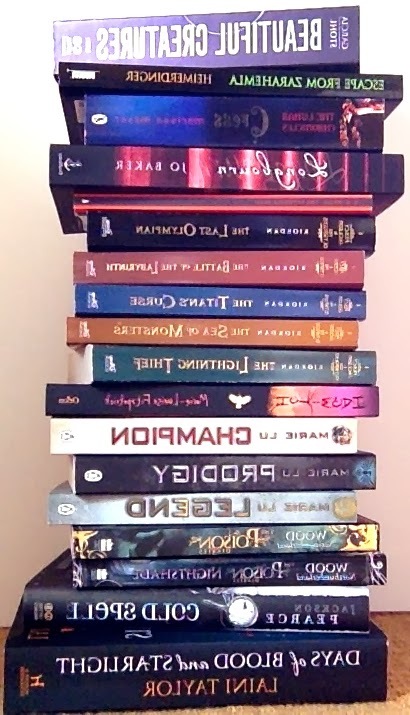 This year I have set myself my longest challenge to date, the 100 book challenge. To read one hundred books in a year. So far, I'm three books ahead (18) and enjoying my success. I always thought that of course I'd read a hundred books in a year, but looking at how much a hundred books actually is makes me question it. Seen as I didn't actually keep track of when I read books, until October last year when I decided to write a review on each book just after I read it. I write only a tiny A5 review, full of spoilers and first impressions before I look at how other people felt about it. I really enjoy it, it lets me know that my impressions are mine and not just influences from others. However, no matter how much I enjoy whatever challenge that I have currently set for myself, I find myself looking forward to the next challenge. What books come out later this year, what is next in my TBR shelf. I'm constantly just racing through books, I don't even know what I'm racing against. Myself? I like to put myself under pressure but am I even enjoying what I read, or am I reading for the sake of reading? A lot of people won't believe me, but I think it makes me enjoy it that little bit more. I don't think I'm happy unless I've put myself under pressure. I like stressing out about my little challenges. I know, I'm obsessive. I did try to warn you at the start. I think, so long as I enjoy reading at the pace I do, that I won't mind testing myself to see if I can stretch a bit farther, read a bit quicker, write more, read more. I know that some people will see it as falling short on forever, but I view it as escalating toward eternity.